I've been off this week. We spent a few days camping in Joshua Tree National Park, which was beautiful but cold at night. I may write a post about that trip next week. We got home Tuesday evening, and immediately launched into Thanksgiving preparations- we hosted this year. Thanksgiving is my favorite holiday. I love the emphasis on being thankful for what we have without the attendant commercialism of Christmas. I love the time spent with family and friends. However, the Thanksgiving history we tell our children (and ourselves) is woefully inaccurate, and I can understand how my favorite holiday is a painful day for Native Americans. I don't think we can look away from that, but I also don't think we need to abandon the holiday. I think we need to own our history, which is much less heroic and far more complicated than our traditional stories imply. I have been remiss in explaining this to my daughters- although, to be honest, we don't focus on the history of the day much at all. However, they do cover it in school, and I should start attempting to add context to this much like I attempt to do for Martin Luther King day. But first, I need to educate myself. Experience has taught me that explaining a difficult topic to my kids is a great way to discover the holes in my own knowledge. Over at Talking Points Memo, Tim Weed argues that it is time we updated our Thanksgiving stories. The Smithsonian Magazine site has a fascinating long article about the motivations of the Native Americans who helped the Pilgrims. I came away from reading that piece wanting to read more, particularly about Tisquantum, the man we call Squanto in most of our stories. Any historians of the appropriate era out there who are tempted by my search for short ebooks to publish: this would be a really great topic! Simon Moya-Smith wrote about how Native American history month gets little attention. I think I also came across this fundraiser via his Twitter stream: the Oceti Sakowin Nations are raising money to help cover the cost of purchasing the last portion of their sacred land. I didn't come back from camping solely to happy preparations for Thanksgiving. As soon as I was back in cell phone range, I checked my Twitter feed and saw that the grand jury decided not to indict Darren Wilson. I was disappointed but not surprised by this. Whether or not Darren Wilson would be found guilty under our current laws, I thought he at least should have faced trial. This piece from the Washington Post argues that Bob McCulloch did a poor job prosecuting this case. I am not all that well-versed on the grand jury system, but the handling of this case as seemed tone deaf at the very least, particularly in light of this case in which a Black police officer was suspended and charged with assault for using his baton. Vox has published two very good pieces about this case, one from Amanda Taub pointing out how much discretion police officers have in the use of force and one from Matt Yglesias discussing the role of our lax gun laws in this mess. I particularly like Yglesias' piece. I have long been trying to formulate a coherent post about how if we want to be a country with such loose gun laws we should try to become a society in which that is not such a dangerous thing- i.e., one in which people handle their guns safely and keep them away from children, in which we teach our young men how to deal with pain and rejection without funneling these emotions into anger, the only emotion which is allowed them by our "boys don't cry" culture. And yes, one in which we don't assume all young Black men are dangerous (see Yglesias' piece for links about that). At the very least, we need to train our police officers to understand their implicit biases and work to fight them so that situations like the ones that led to the deaths of Michael Brown, or Oscar Grant, or John Crawford, or any number of other young Black men can be de-escalated and not lead to death. I cannot accept our current situation, in which white men can open carry assault rifles into stores and in marches but Black men and boys cannot hold toy guns or cosplay as Samurai. Stacia L. Brown wrote a moving piece about how three generations of women in her family responded to the decision not to indict. Edwidge Danticat's piece in the New Yorker about how little has changed since the Abner Louima was attacked by the police is heartbreaking. Ta-Nehisi Coates' piece in The Atlantic about what cannot be said is heartbreaking in a different way. I don't know how we change to be a society that does a better job of living up to its ideals. I think the first step is to be honest with ourselves about how far short of those ideals we currently fall. We need to read and own our actual history, not myths we tell ourselves to feel better. And we need to respect the pain and anger of the communities we've treated poorly and try to stop heaping insult on top of injury. It doesn't matter if the Black boys and men who are shot by police are imperfect people. We all are. They deserve the same benefit of the doubt and attempt to de-escalate that imperfect white people get from the police. It is clear they are not getting it. This does not mean that the police are evil, or even intentionally treating people differently based on race. It does mean that there is a problem in how our police are interacting with a subset of the population, and we should want better and actively look for ways to make it better. That's all I have. It is tough reading this weekend, but I think we need to do it. 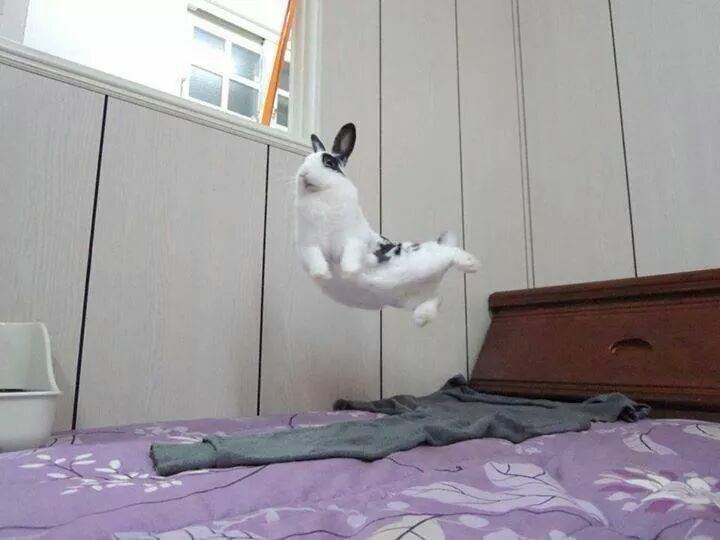 Still, I have to end on something happy, so here is a picture of a bunny jumping onto a bed, found via Awesome Bunnies. I'd like to see a move away from Pilgrims and Native Americans entirely and towards the documented history of Thanksgiving: Sarah Josepha Hale's advocacy for a national holiday of thanks and Abraham Lincoln's proclamation of Thanksgiving, which was done to help the US reunite and heal after the Civil War. It would also be a relevant moment to discuss a prominent woman's role in shaping US history and culture as Josepha Hale was very influential as the editor of Godey's Lady's Magazine.